Comtes de Hainaut, et de Cambresis, avec les confins du Comte de Flandre, du Duche du Brabant, du Comte de Namur, et une partie de la Seigneurie de Liege. 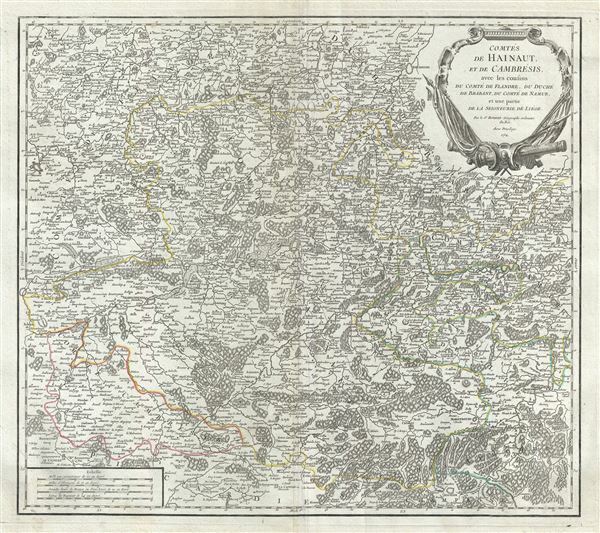 This is an uncommon 1754 map of the western Belgium and northern France by Robert de Vaugondy. The map depicts part of modern day Belgium and France, which was at the time this map was made, part of the counties of Hainaut, Flanders, Cambrai, Namur, the Duchy of Brabant and Liege. It extends from Brussels in Belgium south to Hirson in France and from Douai east as far as Gembloux, Belgium. The entire region shows extraordinary detailed, offering both topographical and political information, with forests and mountains beautifully rendered in profile. The County of Hainaut, an historical lordship within the Holy Roman Empire, was an important region of the Low Counties and was ruled by the Spanish Habsburgs until 1714. It would be ceded to the French in 1797. A beautifully engraved title cartouche adorns the top right quadrant. Issued in the 1757 issue of the Atlas Universal. The Atlas Universal was one of the first atlases based upon actual surveys. Therefore, this map is highly accurate (for the period) and has most contemporary town names correct, though historic names are, in many cases, incorrect or omitted. Very good. Minor wear and creasing along original centerfold. Original platemark visible. Some spotting and offsetting. Rumsey 3353.053. Pedley, Mary Sponberg Belle et Utile: The Work of the Robert de Vaugondy Family of Mapmakers, 193.